Norwegian Bliss: The thermal suite on the Norwegian Bliss include a steam room, a dry sauna, a hydrotherapy pools, heated tile loungers and hot tubs. 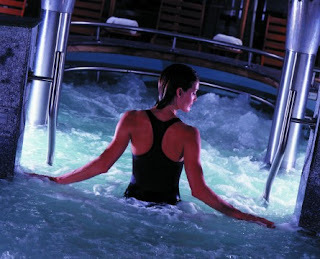 Also, inside the thermal spa you'll find a salt room, one of today’s top spa trends. The benefits of salt therapy are wide-ranging. Salt levels affect our cell activity, energy and blood sugar levels. The calming and detoxifying effects of a salt roomy can support the immune, nervous and lymphatic systems. Additional benefits are reduced stress and headaches, increased energy, and better sleep patterns. Salt ions purify the air and may increase lung capacity. Nearby is the snow room, an ice-cold space that stimulates blood circulation throughout the body. Day and week passes are available for the thermal suite, however guests staying in the Haven Spa Suite, Spa Mini-Suite or a Spa Balcony cabin enjoy complimentary use of the thermal spa suites. Celebrity Edge: The Sea Thermal Suite aboard the CelebrityEdge is themed around the sea, the earth and the air; SEA. There are eight distinctive therapeutic experiences for guests to enjoy. They include the hammam (Turkish bath), salt room, steam room, rainfall water therapy room, infrared sauna and heated tile loungers. For avant-garde experiences guests may try the Float room and the Crystalarium. In the Float room guests burrow into cocoon swings and get gently pushed into a meditative sleep. The Crystalarium, another modern take on the traditional Turkish bath, combines the elements of water and earth, taking advantage of the healing properties of crystals. It is said that crystals act as conduits for healing by allowing positive, healing energy to flow into the body as negative, disease-causing energy flows out. AquaClass guests receive complimentary access to the Sea Thermal Suite although a limited amount of day and weekly passes are also sold.